Jenkins is a tool which was developed long before cloud become the norm and it's definitely not a cloud-native tool, meaning it doesn't have out of the box capability to survive outages, seamless scaling, etc. Basically, Jenkins X is not just a CI/CD tool to run builds and deployments, it automates the whole development process end to end for containerised applications based on Docker and Kubernetes. With Jenkins X, you get not only Kubernetes pipelines for your apps but also a very scalable CI/CD solution. Figure out how to do continuous delivery including promotion processes - eg Promote versions of the application from testing to staging to production. Store all operational configurations like web application source code on the GitHub repository. So all this stuff which developers have to do is kind of unnecessary heavy lifting. Jenkins X is designed to get the above stuff done and focus on delivering actual value to customers. How does Jenkins X help? What does Jenkins X do? By using Jenkins X, the developer can type one command jx create or jx import and the following process : get the source code, the git repository and application created, automatically built and deployed to Kubernetes on each Pull Request or git push with full CI/CD complete with Environments and Promotion. Developers and teams don’t have to spend time figuring out how to package software as docker images, create the Kubernetes YAML to run their application on kubernetes, create Preview environments or even learn how to implement CI/CD pipelines with declarative pipeline-as-code Jenkinsfiles. It’s all automated in Jenkins X. If you want to see Dockerfile, Jenkinsfile or Helm charts for your apps or their environments then those are all available versioned in Git with the rest of your source code with full CI/CD on it all. Let’s have a look at how the JX processes correlate to Git actions. For simplicity, let’s use only master and one feature branch. The table below details the steps of the flow. After triggering this command, we are prompted to authenticate Google Cloud account. It also prompts for some questions on how to create our cluster. It generates a random admin password which is used to access all the applications that we’ve installed. We can now get logs for the build jobs which are actually provisioning the staging environment. Please find detailed logs of the above command displayed below. Please find detailed logs of the above command from the Production environment displayed below. Jenkins X has been successfully installed and default environments are created on our new GKE cluster. The following steps creates a sample Spring Boot application and import it into Jenkins X. It will prompt for some questions like the type of project, mvn group ID, artefact name, spring boot dependencies etc. It initializes this project as a Git repository. It adds some extra files to the repo i.e. Dockerfile, Jenkinsfile, charts etc. This will create a repository in GitHub. Also creates a project in Jenkins and registers webhooks in the Git repository. 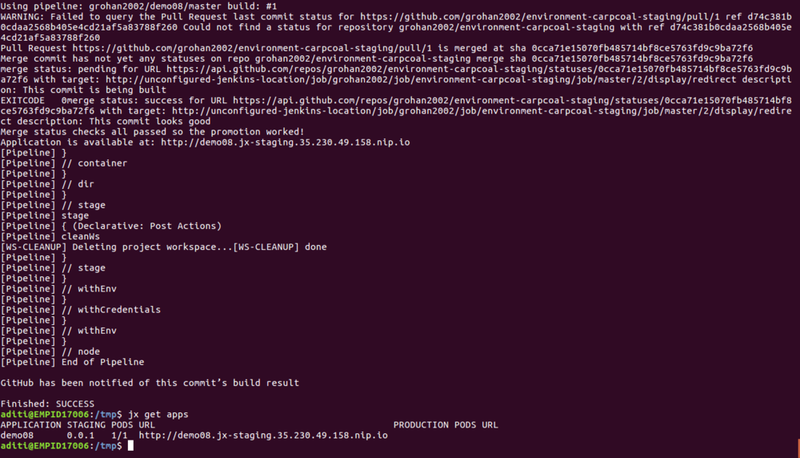 The first build takes time because it downloads some dependencies from maven central. We are using Nexus which was installed as a part of Jenkins X platform so that remaining builds will be faster because dependencies will be cached. After that it tags our potential release & push tags to Github.It then builds application using maven. It uploads artefacts to Nexus so that it can be shared between the teams. Docker image is been built for this application & pushed to docker registry. 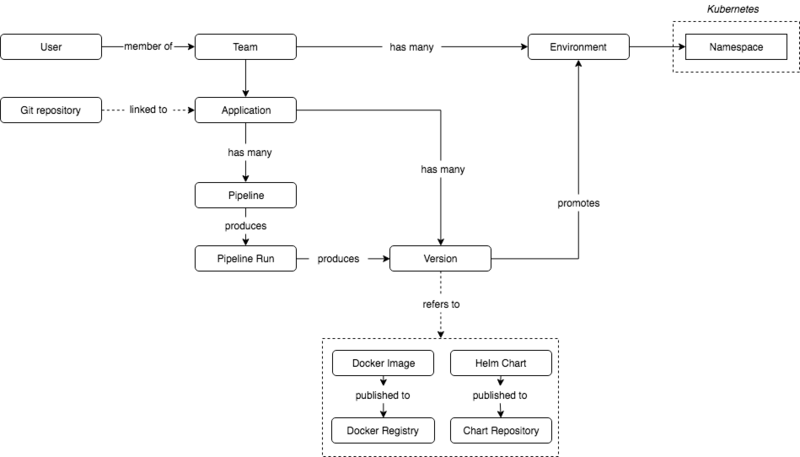 It then generates change log and publish it to chartmuseum registry. Pipeline waits for pull request for staging environment to be merged and then waits for another pipeline to be triggered & perform deployment for our new application on staging environment using helm. Now we can see staging environment with our application running in it. Now we can start working on our new project. Go to your project location and from there you can actually create a Github issue. Now switch to your working branch and add a simple HTML page. Then create a pull request from working branch to master branch. After that our CI pipeline is automatically triggered. After some time, our CI checks pass. 8. There we can see a comment has been added to the pull request saying our application is been built and deployed into the preview environment. 9. Now our application is deployed in preview environment. 10. Now, you can see the application running on the given URL. As you have seen, there was no direct interaction with Jenkins, but it is there, running the pipelines for continuous integration and continuous delivery of the repository, and orchestrating things with Kubernetes. If you run jx get pipelines you can see URLs to the various pipelines that have been setup for you are part of interacting with Jenkins X.
show the state of applications, what versions are in what environments. So this is how Jenkins X automates installation, configuration of Jenkins and some other software components. It also automates CI/CD for your applications on Kubernetes alongwith promotions through GitHub. Aditi is a Software Engineer at Velotio. While she began her career with Python and Django, she switched to automation later. Aditi has worked extensively on setting up DevOps processes and CI/CD pipeline for automation using Ansible, Kubernetes, Docker, Jenkins, and Chef on cloud providers like AWS, Microsoft, Google. Being an avid tv series buff, she loves catching up on her favorite series in her free time.